With the words ’A new manifestation of art was … expected, necessary, inevitable,’ Jean Moréas announced the advent of the Symbolist movement in 1886. When Symbolist artists began experimenting in order to invent new visual languages appropriate for representing modern life in all its complexity, they set the stage for innovation in twentieth-century art. Rejecting what they perceived as the superficial descriptive quality of Impressionism, Naturalism, and Realism, Symbolist artists delved beneath the surface to express feelings, ideas, scientific processes, and universal truths. By privileging intangible concepts over perceived realities and by asserting their creative autonomy, Symbolist artists broke with the past and paved the way for the heterogeneity and penchant for risk-taking that characterizes modern art. The essays collected here, which consider artists from France to Russia and Finland to Greece, argue persuasively that Symbolist approaches to content, form, and subject helped to shape twentieth-century Modernism. Well-known figures such as Kandinsky, Khnopff, Matisse, and Munch are considered alongside lesser-known artists such as Fini, Gyzis, Koen, and Vrubel in order to demonstrate that Symbolist art did not constitute an isolated moment of wild experimentation, but rather an inspirational point of departure for twentieth-century developments. 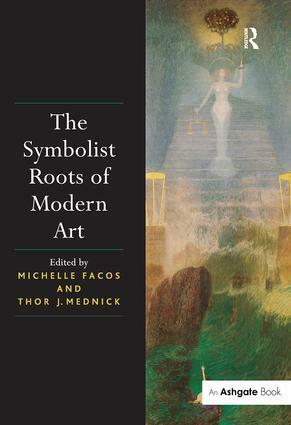 "Facos, Mednick, and their co-essayists persuasively posit that Symbolism is in fact the dawn of Modern art, rather than an anti-Modernist moment as it has so often been described. The Symbolist Roots of Modern Art proves to be a studied reflection on Symbolism’s reappraisal of both the material and the natural, which, in turn, connects it to Modernism’s interrogation of art’s object-ness and disruption of conventional semiotic structures. … Sure to spark lively discussion." "Perhaps the most appealing aspect of this coedited volume is the impressive range of material it offers. Seventeen essays feature fresh views on several acclaimed Symbolists, such as Fernand Khnopff and James Ensor, as well as a selection of studies devoted to underrepresented practitioners of this aesthetic: Nicholaos Gyzis, Konstantinos Parthenis, and Mikhail Vrubel, among others. Summing Up: Recommended. Graduate students." "This volume is an extraordinary contribution to the scholarship on Symbolism and Modernism. It covers not only art, but also the philosophical, historical, and literary contexts of both movements. It clearly demonstrates unexpected interconnections between Symbolism and Modernism and introduces little-known artists alongside famous names." Contents: Introduction, Michelle Facos and Thor J. Mednick. Part I Structure: Idealist ‘grand visions’, from Nikolaos Gyzis to Konstantinos Parthenis: the unacknowledged Symbolist roots of Greek Modernism, Antonis Danos; Otherness, Symbolism, and Modernism in Serbia: Leon Koen, Davor Džalto; Metaphysical longing: the Modernist idiom of Karol Hiller’s visual work, Irena Kossowska; The role of Russian Symbolist painting for modernity: Mikhail Vrubel’s reduced forms, Josephine Karg; The open-ended artwork and the Symbolist self, Marja Lahelma; States of transition: the Femme Fatale in the art of Fernand Khnopff and Leonor Fini, Rachael Grew; Un coup de dessin: looking at the blanks in Mallarmé and Khnopff, Andrew Marvick; ‘Cristalliser leur pensée’: Emile Gallé’s Pasteur Vase and the aestheticization of scientific imagery in fin de siècle France, Serena Keshavjee; Édouard Vuillard and the ornamental drift: among the carpets in Large Interior with Six Persons, Martin Sundberg; Matisse and Mallarméan poetics, Margaret Werth; I object: the devolution of form in Vilhelm Hammershøi and Willy Orskøv, Thor J. Mednick. Part II Theory: True art and pseudo art in Symbolist discourse, Anna Brzyski; Representation in the age of mediumistic reproduction, from Symbolism to the Bauhaus, Allison Morehead and Elizabeth Otto; Of puppets and Pierrots, skeletons and masks: James Ensor's Symbolist staging of modernity, Susan M. Canning; De Chirico and the fin de siècle: the metaphysical paintings and their relationship to Symbolism, Nicholas Parkinson; The relocation of spirituality and Rouault’s Modernist transformation of Moreau’s proto-Symbolist techniques, Katie Larson; From false objectivity to new objectivity: Klinger’s legacy of Symbolic realism, Marsha Morton. Index. Michelle Facos is Professor of the History of Art at Indiana University, Bloomington. She has written extensively on Swedish art and culture and published Symbolist Art in Context in 2009. Thor J. Mednick is Assistant Professor of Art History at The University of Toledo and a former fellow of the American-Scandinavian Foundation. His research deals with nineteenth-century Scandinavia and Europe.